Pet ownership in Australia 2016 - How do we keep our pets? Every three years an association of pet health companies (Animal Medicines Australia (AMA)), commissions a research company to undertake a survey of pet owners and non-pet owners in Australia – the Australian Pet Ownership Survey. The findings of this survey are used to help these companies determine their strategies and identify pet industry trends and opportunities. Survey respondents were asked to identify the number of pets in their household, details on how they keep their pets and some information on their beliefs about pet care. While this report is produced by for-profit companies, for us as animal welfare organisations it gives an extremely helpful and detailed review of how people care for their pets in the home. The pet care industry in Australia is estimated to be worth $12.2 billion annually (yes, BILLION with a B, up from around $8 billion in 2013) so it is no surprise large investments are made in studying it by those who make their living providing services to pets. The full 65 page report is available for free here, but I’ve pulled some of the more relevant details for rescue out and will be publishing these in a series. How do we keep our dogs? The amount people spend on caring for their dogs is nearly seven billion dollars each year. Our dogs are living a very cherished life. They also have access to daily care and veterinary services the envy of much of the world. "Humanisation" is extremely common in Australian pet owners, with most now regarding their pets not just as a companion, but a member of the family. "However, as we have already noted, companionship is increasingly giving way to something closer as dogs and cats become a part of our families... While companionship is cited as the number one reason for initially acquiring a dog or cat, there has been a marked increase in cats and dogs being viewed as part of the family over the past three years, indicating the relationship has become much more personal. Two-thirds of households with dogs (65%) and cats (66%) now regard them as part of the family, up from 59% and 57% respectively in 2013." And this change in how we view our relationship with our pets, has big impacts on how we treat them. 83% of dogs are microchipped. Most dogs are living indoors. The majority of dogs are desexed and microchipped. While smaller dogs and breeds are more popular, 25kgs is no lightweight. The most common way to obtain a dog is through a breeder (36%). The second most common is from a friend or neighbour (17%), followed by a RSPCA or an animal shelter (16%), followed by pet shops (14%). Just 14% of dogs are now sourced from petshop - while breeders have made a massive gain now holding nearly 40% of the market. What is really interesting however, is that despite a massive gain in the portion of people choosing rescue leading up to 2013 (with some reports claiming up to ten times more pets were being adopted each year than at the start of the decade), that this exponential increase may have now reached some kind of plateau. Why? Practicalities probably. People can't adopt dead pets - they just can't. And with still so few pounds working in the adoption arena, this work falls to private volunteer rescue groups, who are limited by resources. Until the government mandates that pounds start seeing adoptions as a vital part of their processes, it is unlikely that the rescue segment of acquisition will grow in any significant way. 30% of dogs are being adopted with little or no cost whatsoever, which is another obstacle for rescue pets. When dogs and puppies are purchased, it is for a few hundred dollars only in most cases. The big challenges moving forward is how rescue can compete with other - free - sources of pets, and whether there are agencies who should be profit-sharing with rescue groups (looking at you, PetRescue!). How do we keep our cats? The amount people spend on caring for their cats is nearly four billion dollars each year. The average cat-owning household spends $1,480 per year on its cats, equivalent to $1,029 per animal (35% have more than one cat). There have been significant increases in the amount spent by cat owners on food and veterinary services – up by 20% and 25% respectively since 2013. Although starting from a much lower base, there have also been significant increases in spending on accessories (up 59%), training and behavior therapy (up 306% since 2013), transport (up 285%) and competitions/memberships (up 165%). (Cat) owners are increasingly focusing on health and wellness, as evidenced by the growth of expenditure on cat treats over recent years. They are much more aware of their cat’s age and condition-specific needs and are therefore seeking more specialised and healthier foods that might promote longevity while also indulging their pet. 93% of cats are kept either exclusively or partly indoors (59% indoor/outdoor + 34% exclusively kept indoors). Just 7% of cats are kept exclusively outdoors. Three-quarters of cats are mixed breeds (76%), while the remainder are pure breeds (24%). Nearly all cats are living an indoor/outdoor lifestyle, with 1 in 3 being kept exclusively indoors. It is good to remember this when advocating for laws which would see cats found outdoors demonised and targeted for impoundment - putting the majority of cats at increased risk of impoundment and death at the pound! It seems most people value their pets welfare, keeping most cats (93%) indoors at least part of the time, and probably overnight. Cat owners are less likely than dog owners to seek out a purebred cat, with nearly 80% of cats of mixed breed origin. This is excellent news for cat rescuers. 32% paid up to $200 and just 5% paid more than $500. The most common way to obtain a cat is through a shelter (25%). The second most common is from a friend or neighbour (19%), followed by a stray cat just showing up and making himself at home. 52% of cats were acquired for free. And most cats (84%) were acquired for under $200. This is massive for the cat rescue sector - high adoption fees are huge obstacle to pet owners choosing to rescue cats. Rescue is a significant source of pet cats (25%) and continues to grow incrementally. However we also need to acknowledge the huge service 15% of cat owners have done us in adopting a stray off the street. Combining stray (15%) and kittens acquired from friends and neighbours (19%) we account for 34% of all cat acquisitions, demonstrating an overwhelming need for support services for people who have a stray show up and drop kittens, and desexing campaigns for all cats, regardless of ownership status. We also don't want to ever do anything to discourage compassion and care - an increasing levels of proactive interventions - for unowned and free-roaming cats, which includes supporting unhelpful campaigns like "Who's for Cats" which discourages people from caring for street cats (who often go on to become housepets). Community cat campaigns have worked universally in other countries and in the locations they've been trialled behind the scenes in Australia. It's really absurd that we continue to ignore and disparage the reality of the [street cat --- to --> pet cat] relationship in Australia. in the face of all evidence that it is the section of the cat population where we could make the biggest positive impact. That people under 35 are such big fans of keeping a dog, and that nearly all families with pets are working, and have children, are all massive considerations for adoption and rescue placement. In short, if you're a rescue who doesn't adopt to young adults, workers or families, then you're limiting the homes who could and would keep a dog enormously, and rescue pets continue to lose out to breeders and pet shops. ... over half (53%) of Australians would like a new type of pet. 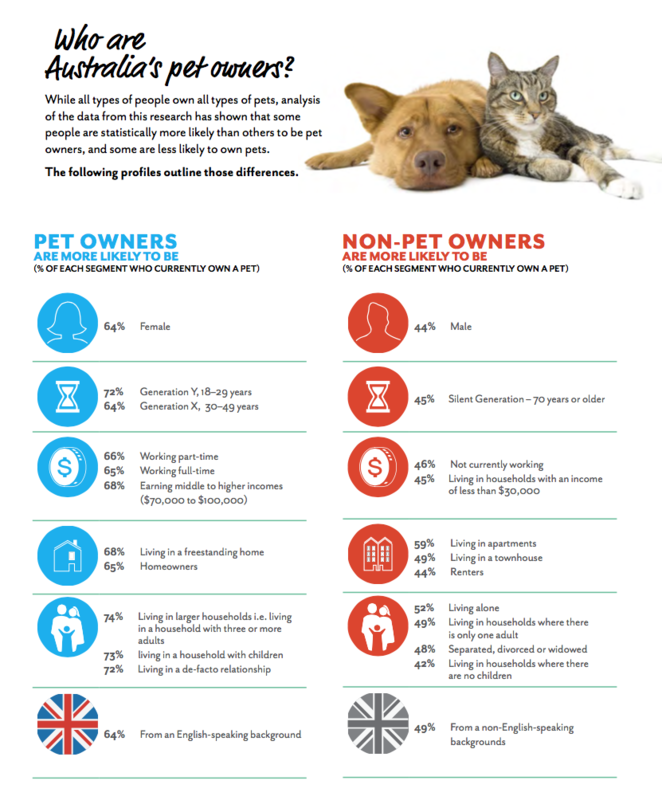 This is stronger among those who do not currently have any pets (59%) than those who do (49%), but both figures represent an opportunity to potentially grow pet ownership in Australia. However, when asked whether they were planning to actually purchase a new type of pet in the next 12 months, only 13% (15% of non-owners and 11% of current pet owners) confirmed that they intended to buy. This indicates that there are significant barriers to owning a pet. 11% of current pet owners confirmed they are likely in the market for a new pet in the next twelve months. With 3.9 million cats and 4.8 million dogs, that's potentially 430,000 new cat homes and 530,000 new dog homes opening up in the next twelve months in homes who already have pets alone. There would be a demand for another few hundred thousand pets in homes who don't currently have a pet. These numbers well exceed the number of dogs (110,000) and cats (120,000) looking for homes via rescue, so to blame ‘overpopulation’ for killing in pounds continues to be bogus. Pet owners in Australia are overwhelmingly responsible and compassionate. Tapping into that enormous potential by showing them that adoption truly is the best option can and will easily overcome the challenges presented by the tiny segment who do the wrong thing. Our massive love for our companion animals can save every life.